How much would you pay for Endless Eight? Bandai has just released detailed information about The Melancholy of Haruhi Suzumiya Season 2 DVD boxset.This release will contain 14 episodes, both dubbed and subbed. Also included are various special features such as “location scouting videos”, “Behind The Scenes of Aya Hirano’s Music Video”, “Endless Eight Prologue”, and a “special event video”, as well as CD tracks for “Super Driver” and “Tomare.” Oh, and don’t forget the exciting “interactive menus!” Oh boy! And the best part: this all-frills boxset can be yours for the low, low price of $64.98! Wait a minute… sixty-five dollars? Bandai wants to charge me sixty-five dollars for fourteen episodes of Haruhi? Worse, eight of those are the same friggin’ episode! GO TO HELL, BANDAI! Sorry, I know I shouldn’t be so pissed. After all, the Japanese had to pay over five times as much for their Season 2 DVDs. Still, charging sixty-five bucks for less than six hours of anime seems a bit extreme, especially when the anime industry (not to mention the entire economy) is in a state of decline. So, yeah… I think I’ll wait for the Anime Legends boxset. How about you, dear readers? Are you willing to dish out the big bucks for Haruhi S2? Let us know in the poll below, then discuss the issue further in our forums! Will you buy the upcoming Haruhi S2 boxset? Right on the heels of Bandai’s Haruhi-chan anime license announcement, Yen Press has revealed (via an unlisted YouTube video featuring the ASOS brigade) that they will be releasing the Haruhi-chan manga starting on October 26th. Yen Press is also planning to release the K-ON! manga this winter. Don’t forget, you can watch all the Haruhi series for free on Crunchyroll, as well as win a special Haruhi virtual badge. Christina Vee and the ASOS Brigade have just announced a new Haruhi license by Bandai. Wow, the acting in that was worse than usual. Could you tell they were reading from cue cards? Anyhoo, it seems we’ll be getting Haruhi-chan and Churuya-san on DVD starting this summer, complete with a Bang Zoom dub using the same voice actors as the main Haruhi series. Of course, if you can’t wait that long for your next hit of Haruhi, you can always head on over to Crunchyroll and watch both shows for free. Crunchyroll, the subscription-based anime streaming site, just announced that they’ve acquired the online streaming and digital distribution rights to all of the Haruhi series. 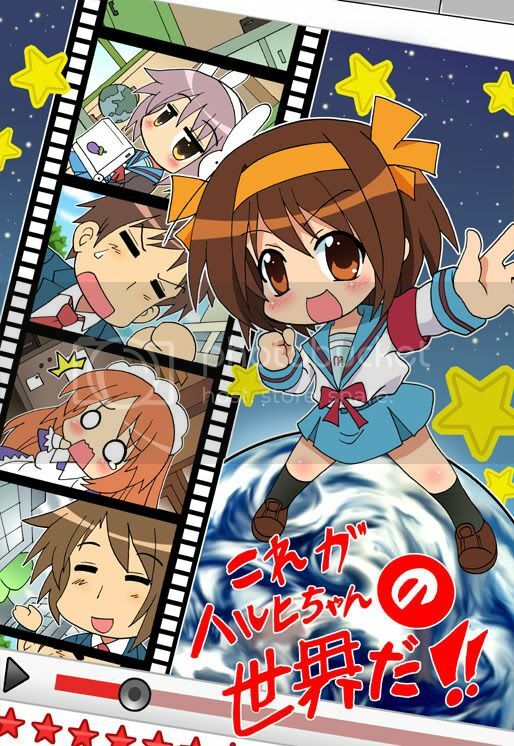 This includes The Melancholy of Haruhi Suzumiya seasons 1 and 2, as well as the webseries Melancholy of Haruhi-chan Suzumiya and Nyoron Churuya-san. It does NOT, however, include the Disappearance film. These shows will soon be available for free to everybody in America, the British Isles, Scandanavia and the Middle East (but not Australia). However, in order to see the ad-free HD-quality streams, you have to subscribe to their Anime Membership service for $6.95 a month. Personally, I don’t think subscribing is worth it. Although I admire what Crunchyroll is trying to do, I’m also frustrated by the crappy quality of their video streams. For example, when I tried to watch Heroman, the HD stream looked so bad that the show was nigh-unwatchable. I think I’ll stick with my trusty Haruhi DVDs for the time being. Apparently, Lotte’s new Haruhi transformation gum is so popular that they’ve revamped their website with a Haruhi theme, as well as posted an extended 30-second cut of their famous Acuo gum ad. It even features a… er, surprise cliffhanger ending. A clean version of the original 15-second version can be viewed below the break. It seems you can’t go wrong with Haruhi product tie-ins. Personally, I’m hoping for some Kyonko-themed pajamas. Make it happen, Japan! Here we feature Minori Chihara the voice of Yuki Nagato. The first music video is indicative of her normal singing style. This bright and cheery number is only excelled by Minori singing in a rain shower. The next example is done in the style of the Big Band singers of the 1940’s, here Minori performs Paradise Lost used as the opening theme song to the anime Ga-rei -Zero- in which she voices the main character Kagura Tsuchimiya. Although official sales figures for the Endless Eight DVDs are still forthcoming, early indicators seem to reinforce Kadokawa’s pessimism about the much-reviled arc’s market potential. In particular, Akihabara’s various anime-oriented stores have seen low sales, with one employee describing them as “mortal”. Whether or not this will translate into poor sales overall remains to be seen; however, it’s not looking very good at this point. 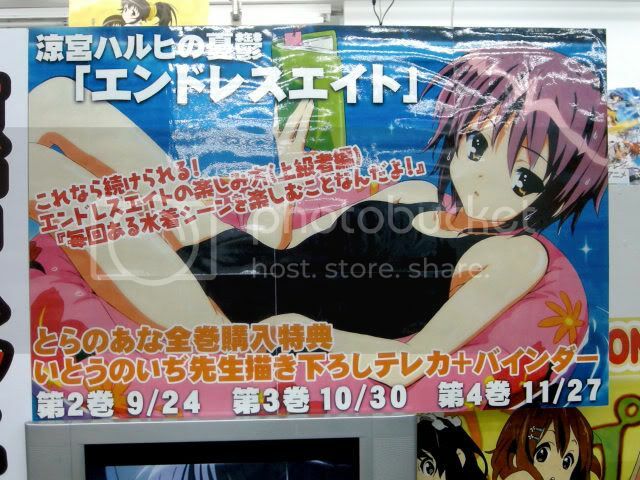 Despite this, Akiba’s shops still feature a wide variety of colorful Haruhi promotional material, some of it emphasizing the fanservice aspects of the E8 arc. The variety of swimsuit designs featured throughout E8 seems to be a particularly potent selling point. Pictures of a few of these displays can be found below. For a peek inside the actual DVD set itself, check out this post over on Cartoon Leap. This MAD, which combines K-On!’s Don’t Say Lazy with the musical stylings of Bollywood superstar Daler Mehndi, has gained quite a bit of notoriety lately.